Pine Ridge Reservation Lifts Century-Old Alcohol Ban : The Two-Way The South Dakota reservation has voted to allow the sale and use of alcohol, a controversial move that critics say will increase already rampant rates of domestic violence and suicide. A sign on a building in Whiteclay, Neb., urging Pine Ridge Indian Reservation residents to approve the legalization of alcohol sales. 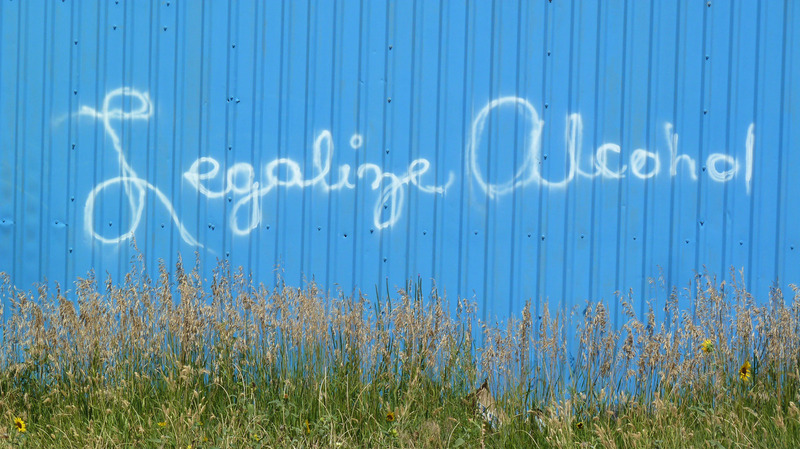 Native Americans at the Pine Ridge Indian Reservation in South Dakota have voted to overturn a more than century-old ban on alcohol in a decision that critics say will spur an increase in already high rates of domestic abuse, suicide and infant mortality. Tribe members finalized the vote count Wednesday: 1,871 for legalization and 1,679 against. Federal law has long prohibited the sale of alcohol on Native American reservations unless the tribe specifically allows it. Pine Ridge — home to Oglala Lakota, or Oglala Sioux, one of seven Lakota subtribes — was established in 1889, and has prohibited the sale and consumption of alcohol for all but a brief few months in the early 1970s, when it experimented with lifting the ban but quickly reinstated it. "Life will change now as we know it," Larry Eagle Bull, one of nine tribal council members who put the issue to a public vote, was quoted by The Associated Press as saying. Opponents found the vote difficult to accept. "How far are we going to let it go?" asked tribal President Bryan Brewer, who staunchly opposed ending prohibition, according to The New York Times. "How many more children are going to be murdered because of this?" "We know the use will go up," Brewer tells the AP. "We know there'll be more violence. There'll be more women and children who will be abused. It will taper off. But it's something we're just going to have to deal with," he said. "I hope they talk about that. I hope it's not just about the money but how we can work with our people." Supporters have said that legalizing alcohol will capture revenue being spent at liquor stores in towns bordering the reservation. They say by ending the ban, the tribe can tax alcohol sales and use the money for badly needed treatment programs. "This is a new era we're in. We've got to remember now we lived dry for 100 years and it was proven that prohibition didn't work. We're in new territory now," Eagle Bull said. Reuters says four liquor stores just outside the reservation in the unincorporated town of Whiteclay, Neb., have done thriving business, and that the reservation's prohibition has been "widely flouted." "Whiteclay has about a dozen residents and its liquor stores sold the equivalent of 162,100 cases of beer in 2012, according to the Nebraska Liquor Control Commission. "Tribal leaders coping with alcohol abuse asked a federal judge in 2012 to block liquor sales in Whiteclay. The judge found the claims did not involve federal law and dismissed the lawsuit." According to The Times, it's "unclear how much money allowing alcohol sales would produce for the reservation, which is one of the poorest places in the country and has unemployment rates estimated at more than 80 percent."